'Magic Flame' and 'All I Am' definitely captured my interest. The former is power metal with a stronger vocal arrangement and heavy metal overtones in the fret work. The latter is less power metal and more melodic heavy metal beginning with an awesome acoustic opening which progresses to epic form to the end. With these songs spinning in my mind, I've realized that there is more to Almah than meets the ear. More than a single listen is necessary. From here expect more power metal with tricks and change ups including some thrash (ala Metallica) on 'Fragile Equality,' some subtle progressive elements ('You'll Understand'), pure melodic metal ('Invisible Cage') and the near ballad like in 'Shade Of My Soul.' The last two are the best songs on the album. The only noticeable downside for me was that too often the guitar solos lean more towards squiggly, wiggly fret virtuosity, then heavy metal. Often the styles coexist in the same song as in 'Torn,' for example. Yet this did not diminish my enjoyment. 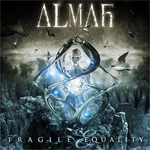 If given only a cursory listen, then Almah's second work 'Fragile Equality' could easily be passed over as well worn power metal. However, I would suggest that this work must be listened to carefully and unwrapped for its genuine creativity and excellent musicianship. 'Fragile Equality' is a better than expect sophomore effort from Falaschi and Almah. Very recommended! If given only a cursory listen, then Almah's second work 'Fragile Equality' could easily be passed over as well worn power metal. However, I would suggest that this work must be listened to carefully and unwrapped for its genuine creativity and excellent musicianship. 'Fragile Equality' is a better than expect sophomore effort from Falaschi and Almah.